The wartime demand for manpower and the racial policy of the Roosevelt administration caused the Marine Corps to agree in February 1942 to accept African-American recruits for the first time since the Revolutionary War, when a few blacks had served in the Continental Marines. The Commandant, General Holcomb, insisted that racial segregation  not only lawful in most places at the time, but enforced throughout much of American society  would prevail and that the African-Americans would perform useful military duty. To gain a military advantage from these recruits, without integrating the races, the Marine Corps decided to group them in a black unit that could train largely in isolation and fight almost independently. Holcomb's policy resulted in the creation of the 51st Defense Battalion (Composite), commanded by whites but manned by African-Americans who had trained at the Montford Point Camp, a racially segregated facility at Camp Lejeune, North Carolina. A decision to use the draft, beginning in January 1943, as the normal means of obtaining manpower for all the services brought more blacks into the Marine Corps than a single battalion  plus its training base and administrative overhead  could absorb. 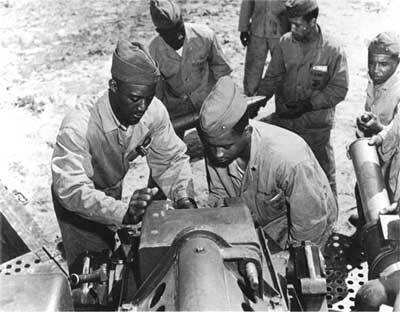 The transition of the 51st from a composite unit to an ordinary defense battalion released infantry men and howitzer crews to help form a cadre for a second African-American defense battalion, the 52d. Because the nature of the conflict was again changing as the advance toward Japan accelerated, the Marine Corps organized no additional black defense battalions, instead creating numerous independent companies to provide logistics support for amphibious operations. The steps taken in May 1942 toward standardized equipment began bringing order to a sometimes bewildering array of new and old, simple and complex. When a veteran master sergeant joined one of the defense battalions as a replacement, he asked to see the "new 155mm guns," but, to his astonishment, was shown a weapon fabricated in 1918. "I thought we had new guns here!" he bellowed. The radio gear and radar required unceasing maintenance and fine-tuning by specialists who themselves were fresh from training. Radar, in particular, seemed a mystery to the uninitiated and a challenge to the newly minted technicians. In evaluating the radar specialists, Captain Wade W. Larkin explained that the device was "technically complex enough for them to be justifiably proud of what they were doing," even though they could not talk openly about so "confidential" a piece of equipment. At the time, radar was cutting-edge technology; Vern C. Smith, who helped operate one of the new sets in the Wallis Islands, recalled that his SCR-268, acquired from another battalion, was so new that its serial number "was a single digit." Marines serving with the Army's 2d Division in World War I wore the Indian-head shoulder patch, and during the occupation of Iceland, in late 1941 and early 1942, members of the Marine brigade adopted the polar-bear flash worn by the British garrison they were relieving. The Marines who sewed on the polar-bear insignia included men of the 5th Defense Battalion. Marine shoulder insignia proliferated after the official recognition of the 1st Marine Division's patch in 1943. The designs chosen by the wartime defense battalions might either reflect the insignia of a Marine amphibious corps or of the Fleet Marine Force Pacific, but they might also be created by the individual battalion. Worn on the left shoulder of field jackets, overcoats, service blouses and shirts, the patches identified individual Marines as members of a specific unit. 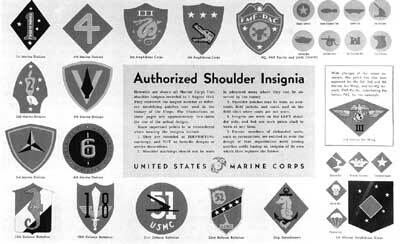 On 1 August 1945, Marine Corps headquarters recognized 33 such designs, although others existed.